Q: According to reports, on June 19, US ambassador to the UN Nikki Haley announced at the US Department of State that the US has withdrawn from the United Nations Human Rights Council. What is your comment? A: China expresses regret regarding the US decision to quit the United Nations Human Rights Council (UNHRC). The UNHRC, established on the mandate of the UN General Assembly, is an important venue for all parties to carry out human rights dialogue and cooperation and jointly promote the development of the human rights cause through exchanges and mutual learning. It is highly valued by all parties. As a devoted champion of multilateralism, China supports the concerted efforts made by the UNHRC and other mechanisms to promote and protect human rights worldwide. We will continue to work with all parties and contribute to the healthy development of the international human rights cause through constructive dialogue and cooperation. Q: The DPRK leader Kim Jong Un has, we believe, left Beijing. Do you have any details on his activities in Beijing today? Who he might have met with? Can you formally confirm that he has now left Beijing? A: If you carefully read our press release, you will find that Chairman Kim Jong Un pays a visit to China from June 19 to June 20. As to the important events during the visit, we will release relevant information in a timely manner. Q: I have another question on the DPRK. Could you give us any information on what was discussed during the visit? 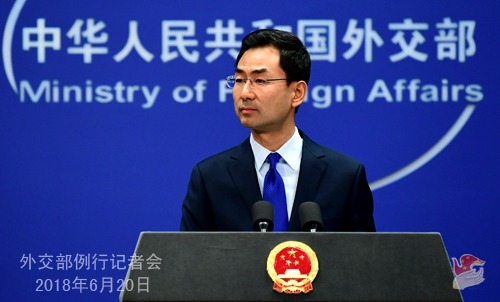 China says it wants to help with the DPRK's path towards denuclearization, could you give any specifics on what form that help might take? For example, would China be prepared to give the DPRK a security guarantee? In addition, what kind of financial and economic assistance might China give which does not violate the existing UN resolutions? A: Regarding Chairman Kim Jong Un's visit to China, a detailed press readout has been released which you can refer to. As for the specific questions you raised, I will give you a brief reply since we have stated our position many times. Recently, thanks to the concerted efforts of all relevant parties, the Korean Peninsula issue has been brought back to the right track of settlement through dialogue and negotiation, and the situation there is moving towards peace and stability. We hope that the DPRK and the US could earnestly implement the outcomes of the Singapore summit and forge synergy with all other relevant parties to jointly move forward the peace process of the Korean Peninsula. While remaining firmly committed to realizing denuclearization of the Korean Peninsula, we have been stressing in the meantime that the DPRK's legitimate security concerns shall be taken seriously and addressed. The Korean Peninsula situation has demonstrated a positive momentum for détente, presenting an opportunity that we hope all relevant parties could act upon. All relevant parties shall continue to work to meet each other halfway and take positive measures to address the DPRK's legitimate security concerns and establish a peace regime on the Korean Peninsula. China is ready to continue with its positive and constructive role in this regard. As for whether we are willing to offer economic assistance to the DPRK, China has been comprehensively and strictly fulfilling all DPRK-related resolutions adopted by the UN Security Council and honoring its due international obligations. Meanwhile, as a friendly neighbor, China maintains normal exchanges and cooperation with the DPRK on the premise of not violating its international obligations. Q: This week, the Chinese Ambassador to India suggested that China, India and Pakistan should have a trilateral summit. I was wondering if this is China's official position? A: Both India and Pakistan are China's neighbors and friends. 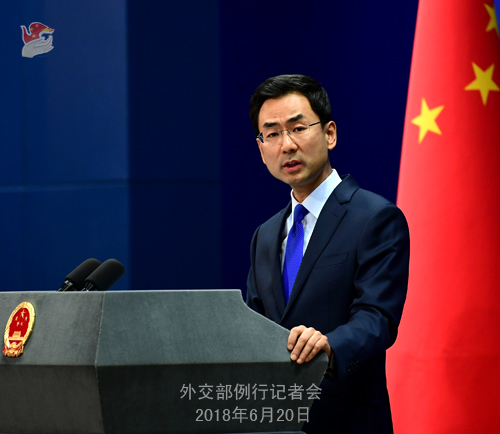 China stands ready to step up cooperation with all its neighboring countries, including India and Pakistan, and promote regional stability and development. We also hope that India and Pakistan can enhance mutual trust and improve their relations through dialogue and negotiation as this serves the common interests of the regional countries. Q: With regard to the US withdrawal from the UN Human Rights Council, the US side called the council a cesspool of political bias and accused China and other member countries of human rights abuses. What is your response? Regarding the China-US relations, will the Chinese side propose trade talks to the US? Peter Navarro, the director of the White House National Trade Council, said that the US is open to trade talks and that if a trade war broke out, China would suffer more losses than the US. What is your response? A: First of all, I will take your first question on the US withdrawal from the United Nations Human Rights Council (UNHRC). As I said just now, the UNHRC, established on the mandate of the UN General Assembly, is an important venue for all parties to carry out human rights dialogue and cooperation and jointly promote the development of the human rights cause through exchanges and mutual learning. It is highly valued by all parties. The US' attitude towards the UNHRC has aroused dissatisfaction from most countries around the world. The US side knows it fully well. The US pointed fingers at the human rights conditions in China and other countries. It is in total disregard of facts. It is impossible for people without prejudice to lose sight of the remarkable progress made by China in its human rights cause. 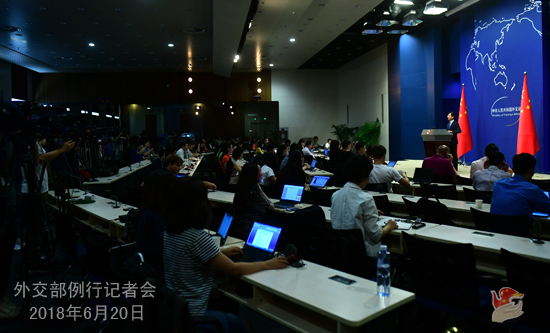 As to your second question, the Chinese side has made formal responses to the tariff lists announced by the US. I only want to stress that dialogue outweighs confrontation with regard to the relevant trade issues. We always advocate that our two sides should properly resolve these issues through dialogue and negotiation. China and the US have held three rounds of trade talks and achieved some progress. During these talks, China has demonstrated full sincerity and goodwill. China won't initiate a trade war, but we are definitely not afraid of one. If someone is bent on waging a trade war, then we will resolutely uphold our legitimate and lawful rights and interests. We will fight to the finish, which we have said many times before. Q: The Yonhap news agency said that the DPRK's supreme leader Kim Jong Un visited the Chinese Academy of Agricultural Sciences this morning. Does it mean that China will enhance its technological cooperation with the DPRK in the agriculture sector? Will China increase its food assistance to the DPRK? A: I haven't seen the report mentioned by you. As is written in the press readout released by the Chinese side yesterday, when meeting with Chairman Kim Jong Un, President Xi Jinping said that the DPRK has made the important decision to shift its focus to economic development and the DPRK's socialist cause has entered a new historical stage. We support the DPRK in its efforts to realize economic development, improve its people's livelihood, and pursue a development path that suits its national conditions.